Like a blank canvas ready for the artist's touch, the Casey daybed is the perfect base from which to build a room. The Daisy collection is designed to fit the lifestyle of any young lady. 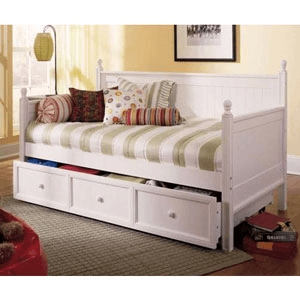 This attractive group features two bed options, a panel bed and a day bed. The matte white finish is airy, creating a bright and light space that everyone can enjoy. With plenty of convenient storage options, and versatile pieces that will grow with your child, this collection has a lot to offer. Dimensions:Product Height 49.75 Product Width 53.5 Product Length 82.25 Weight: 223.77 pounds Some assembly may be required. Please see product details.